Need to Order a keg for your kegerator, party or event? We can help! Because of the continually changing rotation of beers and the changing inventory levels at our distributors, we don’t keep an updated list of kegs available for purchase, so simply fill out the form or give us a call at 919-446-1156 and we’ll confirm pricing and availability. We also have Keg Pumps available. By filling out this form, we will receive your request by email and track down the distributor who delivers us the beer. We will track down the distributor who delivers us the beer. 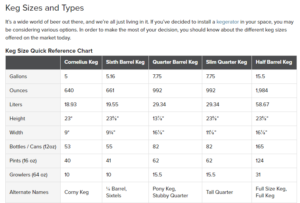 We will then calculate the keg cost and contact you to determine if you would like to proceed with the order. Please include your name, email address, phone number, the beer you are looking for and the size keg you want. We will get back with you on the cost and availability within 24 hours. Please tell us what keg size, brewery name, beer name and anything else about your order in Message area below. We do require a credit card when you place your order as once the beer is received at Cellar 55, we cannot return it to the distributor. We recommend that you allow at least a week’s lead time as not all distributors can deliver to us every day. Please remember to bring your driver’s license with you at time of pickup. Not all breweries allow for off premise purchase of their kegs and some breweries do not allow off premise purchase on some of their draft options. Example: Fullsteam Brewery does not allow off premise purchase of any of their kegs. Foothills Brewing allows for off premise purchase on their core beers, but things like Jade or Sexual Chocolate are NOT AVAILABLE for off premise sales. Please note that we do charge a $50 deposit on each keg purchased. Once items are returned to us in good condition, we will promptly refund your deposit in the manner in which was originally paid. 1/6 barrel, also referred to as a sixtel or cylinder, contains 5.16 gallons of beer and yields about 55 twelve ounce pours or approximately 40 – 42 pints. 1/4 barrel, sometimes called a pony keg, contains 7.75 gallons of beer and yields about 85 twelve ounce beers or approximately 60 -62 pints. 1/2 barrel, also called a keg, contains 15.5 gallons of beer and yields about 165 twelve ounce pours or approximately 120 – 124 pints. A full barrel of beer, which is how breweries measure and report their output is actually 31 gallons of beer, however, there is no packaging or distribution of this quantity. Craft brewers that package in 1/4 barrels include Bell’s Brewery, Founders Brewing Co., Lagunitas Brewing Co., and Horny Goat Brewing Co. These breweries do not distribute in 1/6 barrels. Imported beer most often comes in 20, 30 or 50 liter sizes and selection is sometimes limited. A UK coupler may be required for these style kegs.